There is no doubt that the world has changed fundamentally since the collapse of the global economy last year. We are heartened to see that out of the dust has emerged a new mantra of "less is more" and "work with what you have." Throughout our travels over the last six months, which have exposed us to many different issues and cultures, we have seen this paradigm shift unfolding in every corner of the world. A handful of recent press highlights both the importance and the vast potential of this fundamental shift. 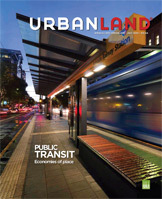 Our lead article from the May issue of Urban Land, along with a an article in the Canadian magazine Municipal World describe how such diverse areas as Australia, Chicago and Hong Kong are using Placemaking to improve their public spaces. In an article in Recreation and Parks Magazine--British Columbia, Cynthia Nikitin writes about how civic institutions can adapt to this new climate by reaching out into the communities they serve. Convene Magazine, published by the Professional Convention Management Association, recognizes the potential of placemaking to boost tourism in a profile of Fred Kent entitled "The Place Doctor." And on a grassroots level, community organizations and placemakers are organizing entire communities around the public realm, such as in Savannah, Georgia, where six organizations took on the entire municipal establishment to get them focused on livability issues. They encouraged the public sector to recognize the assets right under their noses—streets, parks and community institutions—that can easily become part of a growing city campaign centered around issues of health, walkability, and sense of place. The world has changed and we are seeing a shift that bodes well for the future. Read more about some of these promising developments in the articles below. The current economic downturn presents not just challenges, but also opportunities to change the way we think about development. Explore how more and more people around the world are expressing an interest in learning how to make their local assets into destinations within their cities that work as catalysts of economic growth. Throughout the world, governments, organizations, and private citizens have begun to look for ways to reinvent their communities around the simple idea of "place." Simple Placemaking principles are already transforming communities’ most important places into vital destinations in diverse locations including Australia, Chicago and across Canada. Civic institutions, such as parks, libraries, city halls and cultural facilities, are the foundations of a civil society and the cornerstones of democracy. By working together and pooling their unique strengths and areas of expertise, these institutions and the communities around them can identify their true potential to better serve the public by tackling common challenges. In these difficult economic times, can we afford to invest time and money in creating special places in our cities? According to PPS President Fred Kent, we can’t afford not to. In fact, Kent says that Placemaking is a cost-effective way to revive prosperity through alternative economic and urban growth. Last February, Fred Kent and over 300 Savannah citizens met to discuss how to transform the city’s car-oriented streets into pedestrian-friendly destinations. Since then, Savannah's citizens have taken bold action to begin making these plans reality. As Theodora Gongaware writes in Savannah Now, Savannah’s citizens are working energetically to "make each neighborhood a destination by taking advantage of resources that were already in place." "The Place Doctor" Convene Magazine—Professional Convention Management Association A profile of Fred Kent explores the opportunities for towns and cities to connect Placemaking to tourism. "Whole cities can be changed," said Kent, "by thinking about community places." Tempe hired PPS in 2006 to create a comprehensive open-space plan for their downtown. The innovative ideas in the plan have been put on hold by the economic downturn; but if the plan’s building blocks are in place when the economy recovers, Tempe runs much less risk of being blindsided by developments downtown and along light rail.